Simone Walker’s at the right, standing with Bayla and Murray Jacobson. People come to AIPAC to show their support for a strong U.S.-Israel relationship. And they come to express their concerns about issues that affect Jews and their connection to Israel. Surrounded by thousands of Jews and friends, AIPAC’s voices are loud and clear. Attendees listen to global leaders, senators, representatives, both Jewish and non-Jewish, as they tell their stories and talk about things that make the audience stand up and applaud. A great feeling washes over the AIPAC supporters and they walk away with hope; just like the words we sing in the Israeli national anthem. But that is not all AIPAC is about. For me it is about making connections. It is about hugging and kissing your cousin from St. Louis whom you haven’t seen since last year’s conference. It is about meeting up with that friend who moved away to Florida. It is about seeing your young cousin who is now a dentist in Baltimore and has three little children. It is seeing your children’s Solomon Schechter Day School principal after so many years. It is about recognizing your old rabbi, who moved on to another congregation in another state. For me, the highlight of last month’s AIPAC conference was seeing one particular old dear friend. I grew up in Savannah, Ga., and went to the B.B. (as in Bnai Brith) Jacob Nursery School for two years, from when I was 3 till I was 4. We were a very tight-knit Jewish community, and all of our lives were integrated, one with the other. Among the boys in this school was one Murray Jacobson. 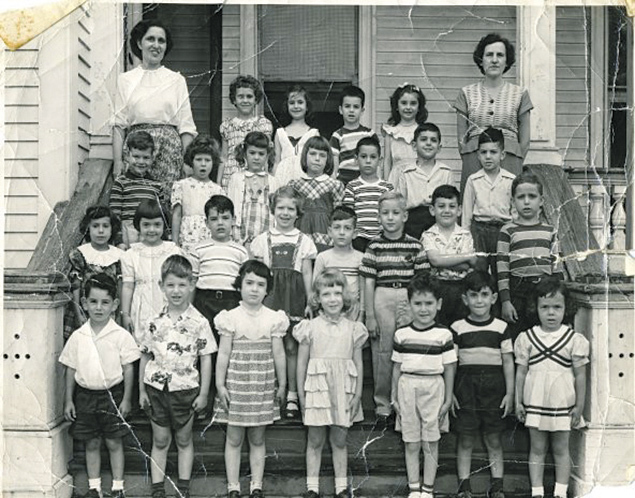 Simone Wilker’s nursery school in Savannah in 1949. She’s blonde, front and center, and Murray Jacobson is in the second row from the bottom, sixth from left, in a striped shirt. After nursery school, a few of us went on to the first and second grade together; still at this same B.B. Jacob Hebrew Day School. There was no kindergarten at that time. At the start of second grade, Murray was told he could skip the second grade and move to third. He was that smart. There was no Hebrew day school for the third grade, so Murray attended public school. I was devastated and angry. I wanted to skip second grade too! How dare Murray Jacobson jump ahead without me? But I survived without him, and we were six students in that second-grade class at the Hebrew Day School: Berta Adams, Lynn Rabhan Owens, Sammy Sutker, Jerry Portman, Skippy Platt, and me. Of the six of us, two still live in Savannah and three live in Atlanta. I lost touch with Murray because his family moved away from Savannah. Fast forward to 68 years later, and for some reason I decide to Google his name. Wow! There is a Murray Jacobson living in the Washington, D.C., area. After several attempts, we reconnect and find out that we are both going to attend AIPAC. This year, Murray, his wife and I met up in the AIPAC Village in between sessions. Can you imagine seeing someone you knew at the age of three and now you are 73? How weird is that? Who would think that the relationships built at an early age would remain in place? I felt as though I had seen him yesterday. Of the 18,000 people who attend AIPAC, I can only imagine how many old friendships have been revived by everyone coming together in Washington. This is what the world should be all about: relationships with people you care about, all the while fostering a love of Israel. I’m so proud of my friends and family who come from near and far to attend this conference — for many at great expense. It makes the event personal and creates an atmosphere of love and caring. It is great to be Jewish. Thank you AIPAC for making this happen. 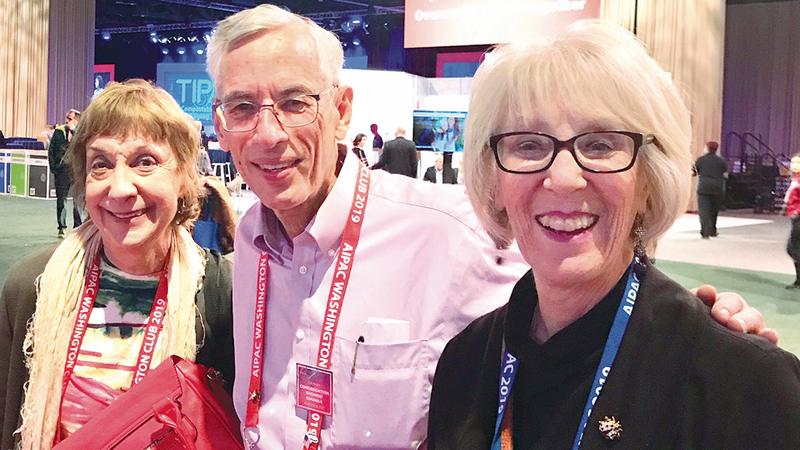 Simone Wilker of Washington Township, who recently retired as the owner of AlphaGraphics, has served as a board member of Temple Emanuel of the Pascack Valley; she and her late husband Bernie chaired the synagogue’s move from Westwood to Woodcliff Lake. She continues to kept close to her roots as a member of Congregation Agudath Achim in Savannah, Ga.,; she now splits her time between Atlanta and New Jersey. She’s been involved in many Jewish organizations, such as Hadassah, JCRC, JNF, and AIPAC.